An age old blend of organic black tea, a touch of sugar, loads of fresh ginger, and delicate spices. "Sherpa Chai is as much about the community as it is about the chai. When we're cooking tea, we're thinking about the people in Nepal who picked it." Sherpa Chai isn't just the chai Pemba's mother made him. It's the chai her mother made for her. The chai her mother's mother made before that. This recipe has been integral to the Sherpa people as built their homes high in the Solukhumbu region of Nepal. When Pemba was 16 he began working as a guide, carrying baggage and food to the basecamps of Everest and others of the world's highest peaks. Soon he was able to form his own trekking agency, Sherpa Ascent International, leading tourists up peaks and on treks in Nepal, Europe and Africa. In each place he would leave his mark by donating cloths, time, and money to uplift the people there. Pemba eventually made Boulder, Colorado his basecamp, directing and leading over 40 trips to Nepal over the course of 15 years. In 2001 one Pemba started Sherpa's Adventurer's Restaurant and bar. It was here the first gallons of his age-old recipe were made. From a recipe passed down through generations of Sherpas. The recipe his mother had passed on to him began being served by the gallon everyday. People were loving it. In every comment about the restaurant was at least one mention of the chai tea. In 2013 Pemba decided it was time to share his family's recipe more widely. He enlisted Jacob Dana and together they started turning the Sherpa's chai into Sherpa Chai™. He is now proud to be the first indigenous Sherpa to offer this timeless beverage to you and your family. Jangbu Sherpa who has summited Mt. Everest ten times without the aid of supplemental oxygen, remarked that at each camp on the way to the top there was a hot mug of this same family recipe waiting to keep spirits high and climbers warm. Lakhpa Sherpa, another Everest summiteer drinks Sherpa Chai every morning before heading to work at Sherpa's Restaurant. It's been that way for centuries. A hot cup of chai sends journeyers off and welcomes travelers home. It's a daily drink, but also holds a spot on the table next to Roxi and Chang during the various celebrations and festivals that occur throughout the year in Nepal. As chai is an essential beverage for millions in Asia, it is quickly becoming a staple in this country as well. In the US iced chai is a refreshing beverage after a long hike, a grueling day at school, or non-stop meetings at work. Grab a mug, grab some friends and sit back and enjoy some Sherpa Chai! Pemba Sherpa is a seasoned outdoor veteran. He cut his teeth leading expeditions in the Everest region of Nepal, ushering tourists up some of the world's highest mountains. He's competed against the best Ice Climbers in the world in Ouray, Colorado. He put it all on the line in 2000 with a daring, free-solo ascent of the world renowned Fang in Vail. Pemba runs at an elite level, soaring a 2003 5k in 15 minutes and 17 seconds. As an indigenous Sherpa, he's proud to share Sherpa Chai, his family's recipe, with you. Dilli makes chai and chai makes Dilli. Not only does this native of Ilam – Nepal's tea capital – craft the most delicious chai on the market, but he is a poet, social activist, loving father, regular blood donor, and documentary producer. His love for chai is as vibrant as his love for humanity. That fact is made clear by how thoroughly he chooses the ginger, lovingly inhales the intense aromas of the spices, and, when it's all said and done, blissfully sips the first sips of each batch of the still warm Sherpa Chai, chai tea concentrate. Jacob makes it happen. From helping Dilli with production, sourcing the finest ingredients, ordering bottles and labels, to sales, marketing and administration he has his hands in every aspect of Sherpa Chai. Jacob likes to start his day with a steaming hot Sherpa Chai with a shot of espresso – a Cold, Dirty Sherpa if the weather's warm – before work each day. When he's not out for Sherpa Chai you can find Jacob struggling up some route or another in Boulder Canyon, in Fruita cruising Horsethief, or out for a casual run up Centennial Trail to the top of Mt. Sanitas overlooking Boulder. Chiri is from Kathmandu, Nepal. His family is Newari, the native group of Kathmandu Valley. The Newari are mostly artists, so he naturally is an artist, too. He used to make copper statues of the Buddha in Nepal, carved stone, and still writes poems. He attended school in Kathmandu where he studied Business. He has been in the US since 2007. 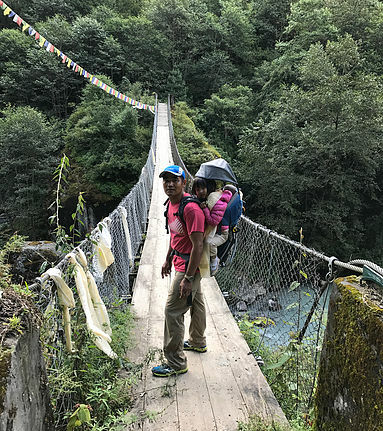 He likes connecting with customers, hiking, traveling to new places, cooking typical Nepali dinners with his wife Regina, and of course drinking Sherpa Chai. Come meet Chiri at your local Sherpa Chai-carrying store where he'll be talking about Nepal, art and serving up delicious Sherpa Chai. Lanny is originally from Gulfport, Mississippi. When he's not enjoying Sherpa Chai you can find him tearing up some mountain biking, snowboarding, trail running, or playing soccer. He loves all types of music and going to see live shows. More than anything he enjoys being with his family, his beautiful wife and four-year-old son. Lanny is committed to helping Sherpa Chai grow and seeing that its profits go back to the community and charitable projects. Todd hails from the great state of New York. He's our sales guru, helping bring Sherpa Chai to you and the world. His fun energy and giving nature blends well with the Sherpa way. He loves creating community. He believes whole-heartedly in the philosophy that when we give, we receive, and generate abundance. When he's not sharing Sherpa Chai, Todd enjoys being with his family, hiking, tracking – he'll find a deer or bear trail and follow it tirelessly for just a glimpse of the majestic wildlife in its natural habitat. He writes avidly, loves traveling and generally living the dream. Making a difference in Nepal. It wasn't just the chai his mother served him each that fundamentally shaped young Pemba Sherpa. In the Khumbu Region of Nepal there are no cars, buses or even bicycles. One has to walk everywhere. For the children of Sengma that meant walking nearly an hour and a half downstream to the nearest bridge and an hour and a half back upstream to school. This was the daily trek that gave Pemba many of his impressive qualities: strength, perseverance, patience... He also learned compassion. After the monsoons washed out that vital bridge the village people constructed a temporary bridge so they could continue to cross the treacherous Dhud Koshi, which even at its lowest is a powerful torrent. It was then, as a boy, that Pemba witnessed a fellow school child get swept away to his death when the temporary bridge failed. When he came to America, to make his fortune, he immediately started working towards the goal of building a new bridge for the people of his valley and village. Completed in 2011 the new bridge cuts the commute for the school children from 3 hours to only 30 minutes and provides safe passage to thousands.